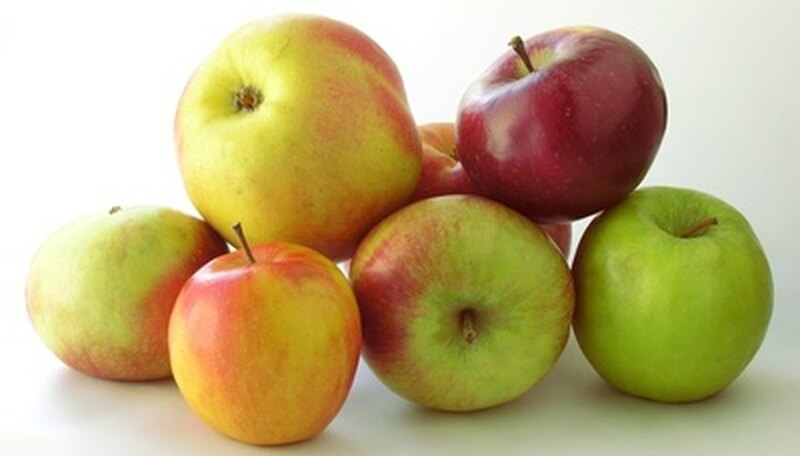 Winter apples are varieties that mature and stay ripe through the colder seasons in the year up through spring. Known as a fine cooking apple, winter apples also store well for long periods of time (up to a year) and usually have a sweet flavor and crisp texture. Winter apples come in dozens of different varieties, but there are some differences in flavor and appearance among the most common types. This medium-sized, colorful New Zealand variety is popular in the United States. With red, yellow and orange splashes all over the firm skin, it is one of the more colorful varieties. Braeburns have a sweet, tart flavor and aromatic fragrance. This winter apple has one of the longest storage times, up to one year from the harvest date. Braeburns are most commonly used for baking, put into pies, made into applesauce or sliced fresh and eaten. Since 1915, this variety from Geneva, New York has been popular as a large, perfectly cylindrical, bright red apple. The apple has flat ends and thick flesh that is resistant to browning and wrinkling. Cortlands are ideal chopped up fresh in salads. They also work well for baking since the variety retains its firmness in the oven, skillet or grill. The downside is that Cortlands do not keep as well as other winter apple varieties. This apple is one of the best for baking, since it retains its texture and flavor once cooked thoroughly. Rome Beauty, also known as Red Rome, is originally from Ohio and is harvested from late fall to early winter. Rome Beauties range from medium-sized to very large, store for up to seven months after harvest time and turn either bright red or light green. The flesh is sweet and tart, with tough skin.